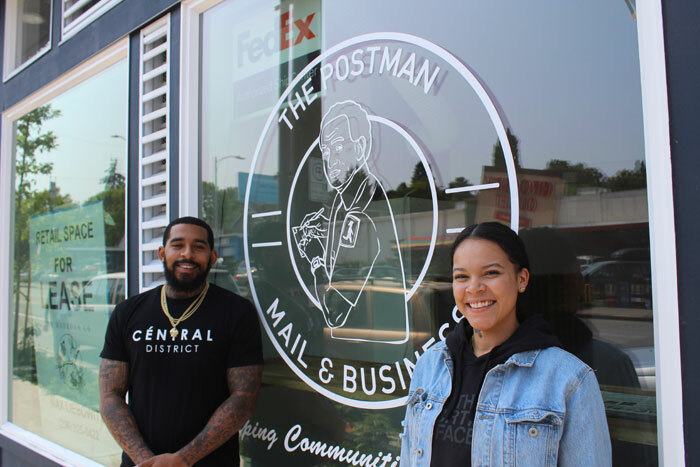 D'Vonne and KeAnna Pickett have opened their first small business, The Postman, in the Central District for the neighborhood's mailing and business needs. After two years of planning, KeAnna and D’Vonne Pickett have opened The Postman in the Central District. The husband-wife team met while D’Vonne was at Rainier Beach High School, and attended Central Arizona College together. D’Vonne went on a basketball scholarship, but both ended up playing there. When they returned to the Central District, they made a list of businesses they could start, which included a food truck, laundromat and post office. D’Vonne Pickett’s great-grandfather, Jacques Chappell, worked as a United States Postal Service mail carrier in the Central District for 37 years. He passed away in February, and a silhouette of his smiling face is the business logo for The Postman. The Picketts go back five generations in the Central District, and owning a small business there supports the neighborhood, which supports them in return, they said. “… Filling the void,” KeAnna said. The USPS Post Office at Midtown Center, several blocks west on East Union, will go away when Lake Union Partners begins redeveloping that superblock in the near future. LUP principal Patrick Foley confirmed in July that plans are for the post office to return after construction. The Postman is a FedEx-authorized shipping center currently, with plans to expand its private carriers soon. D’Vonne said they’re also looking into joining Amazon’s new package delivery program. The Postman provides private mailboxes and self-service copying, faxing and scanning. Soon the business will add notary and money order services. KeAnna Pickett said they’ve been listening to customers since opening on Aug. 1, and will work to meet their needs. Lake Union Partners had been negotiating with the Picketts to secure space in The Central building, across the street from Midtown Center, but it didn’t work out. “Our plan didn’t really work out with their plan,” D’Vonne said, so the space was added to a new Tacos Chukis location. Lake Union Partners contacted The Madrona Company developers Marty and Max Liebowitz about finding room for them in The Valley, a new mixed-use apartment building at Martin Luther King Jr. Way and East Union. D’Vonne said the building owners liked the idea of a post office because of the traffic it would generate at The Valley. And the design the Picketts had for the business ended up working better in the space provided at 1143 MLK Jr. Way. Plus, there’s way more parking available for customers. KeAnna said they’re enjoying being small-business owners, after gathering so much experience from various jobs over the years. D’Vonne worked as a supervisor at UPS for a time, he said. “We put in the same amount of hours working for other people,” KeAnna said. The Central District entrepreneurs are currently running things on their own, but expect to be hiring once they get the business more established. KeAnna said they’d like to find local high school and college students looking for job experience. A grand opening for The Postman is planned to start 6 p.m. Friday, Aug. 31. The Postman is open 9 a.m. to 6 p.m. weekdays, and 10 a.m. to 5 p.m. on Saturdays. Find out more at thepostmanseattle.com.